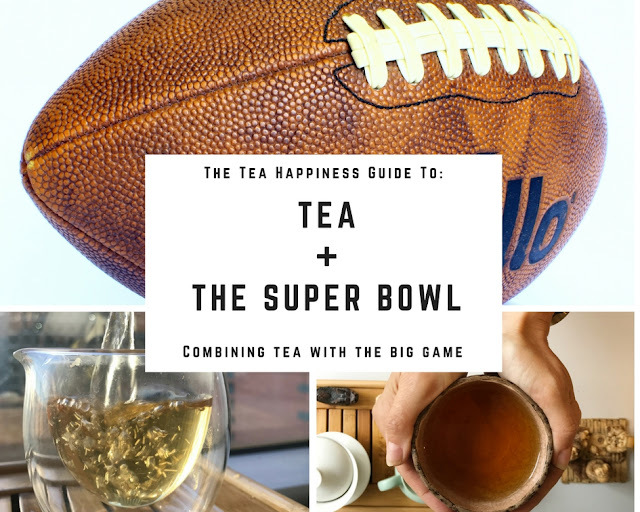 Do you enjoy watching football, or is your idea of a Super Bowl using your biggest cereal bowl to make matcha? Well, whether you watch the Super Bowl attentively or sit near the TV while scrolling through Instagram, this weekend is the 'big game' and I thought it would be fun to suggest ways to infuse the festivities with tea. From tea and food pairings, cooking with tea, to straight up 'tea beer', there are many ways to celebrate the day with your favorite beverage. Game-watching food is meant to be grazed- you know you'll be picking at various snacks for a few hours, basically non-stop. The common theme is heavy, greasy, and spicy. There may be some veggies on a platter, but you know they're meant to be dunked in the onion dip. If you'll be nibbling on spicy wings, nachos, and seven-layer dip until the final touchdown, go for a puerh. I'd choose a silky, deep shou to wash down the spicy and greasy treats. Bonus points if you drink your shou gongfu style, set up among the wings and dip. If you're more likely to stick with chips and a creamy dip, or maybe veggies and cheese for most of the evening, I think a vegetal green tea such as bancha would work well. It's got a bit of astringency to work with through heavy chips and dip, but will also compliment veggies and milder cheeses. Or if you'll stick with noshing on a bowl of potato chips, a White Peony would work quite well (but probably not a Silver Needle). The hay-like flavors will enhance the potato. If you'll be eating pizza, I think a kombucha would really win the day. Whenever I think about pizza, I just love a good, fizzy drink to go with it. Kombucha's got the fizz, a sour punch, and a nice sweetness. The perfect foil for that oily pizza, and a great substitute for soda. There are so many different varieties of Kombucha out there, so pick up a few and see what you like. If I had to choose, I'm partial to GTs and Health Ade. If chili is on the buffet, I think a Keemun tea would be great. The smooth chocolate note in a good keemun will really round out the chili. Or a malty Assam would be a nice choice as well, to highlight the earthy and spicy notes. Are we getting a bit too highbrow with the pairings? Any tea with a bit of heft will work well with most Super Bowl-approved foods. Apparently, beer tea is a thing. I've seen matcha beer served at 29B in NY, although I haven't tried it. For straight up beer and tea recommendations, I found this page, which lists many varieties of tea beer. No time to order? Check out stores that have a large beer selection, you never know what you'll find! I also noticed that Owl's Brew (they make some very tasty tea cocktail mixers) sells Radlers which are a blend of tea, beer, and other flavors. Now you know! Why not add tea right into your party food? Last spring I posted my recipe for Lapsang Souchong infused chili. It's quite delicious, and perfect for a crowd. The slightly smoky flavor works really nicely with the beans and spices. You can serve it alone or pile it on chips for amazing nachos. There you have it, lots of different ways to enjoy your tea during the Super Bowl. What's your plan for the big day? I'll be at a party with tea in hand and one eye on the game, and one scrolling through Instagram.